I distinctly remember the first time I heard about kombucha. In 2010, I sat in the back of a meeting for Brooklyn food startups that I’d help to organize. Hoping to learn strategies on how to connect with customers digitally, these budding businesspeople ranged from food bloggers, to bakers and picklers, to this one guy proudly touting his new business, Kombucha Brooklyn. As he enumerated the drink’s health and taste benefits, I found myself eager to try a sip of this concoction, despite having no idea what he was talking about. What did he mean by fermented – as in, alcoholic? And how do you ferment tea? Intrigued, I brought home a bottle to try the following day. If you’re a kombucha drinker, you probably remember your first sip, too: I felt unprepared for the sweet yet bracing flavor, the carbonation, and my utter inability to classify this drink in relation to something else. Eva has been drinking and making kombucha for more years than she hasn’t, originally captivated by (and obsessed with) the drink as a teenager in Munich, Germany. 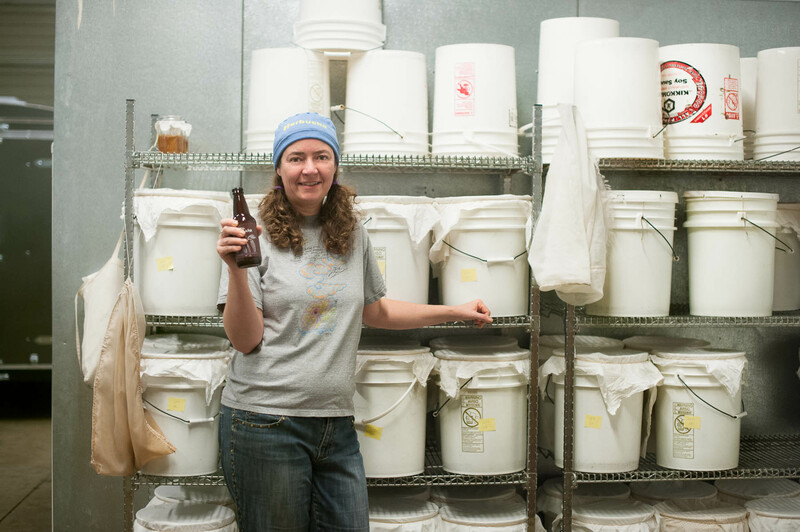 Brewing kombucha was a natural progression: she had begun to buy more bottles than she could afford and thankfully discovered an aptitude for the kombucha making process, which meant she could brew as much as she wanted to drink. The sentiment is entirely apropos when faced with a professional or personal crossroads in life. Until recently I had assumed Frost’s poem implied a left or right choice, each different from the current path. Yet after experiencing my own career impasses and hearing similar stories from friends, farmers, and businessmen and woman, I now interpret the poem differently. I believe the choice Frost mulls over involves veering off in a compelling, nerve-wracking direction, or retreating. 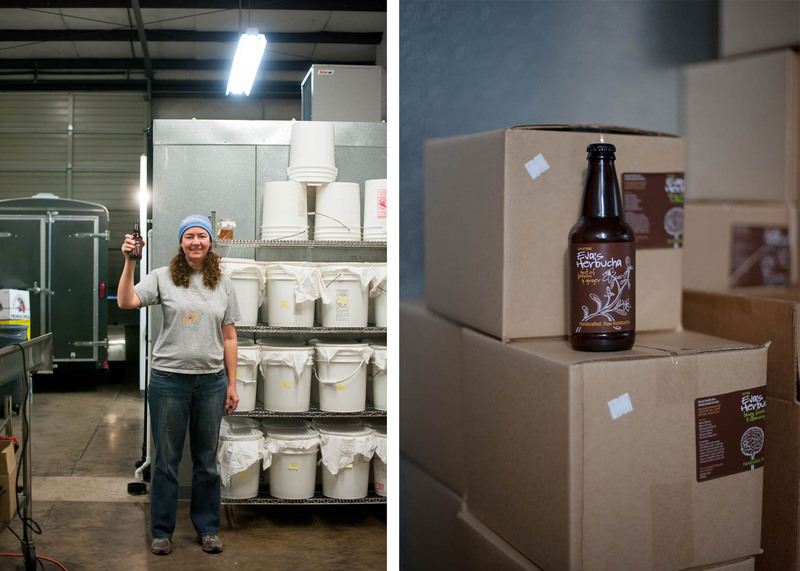 In 2007, Eva was laid off from a job she didn’t enjoy and suddenly had the chance to transform herself from a weekend kombucha brewer to a daily kombucha businesswoman. 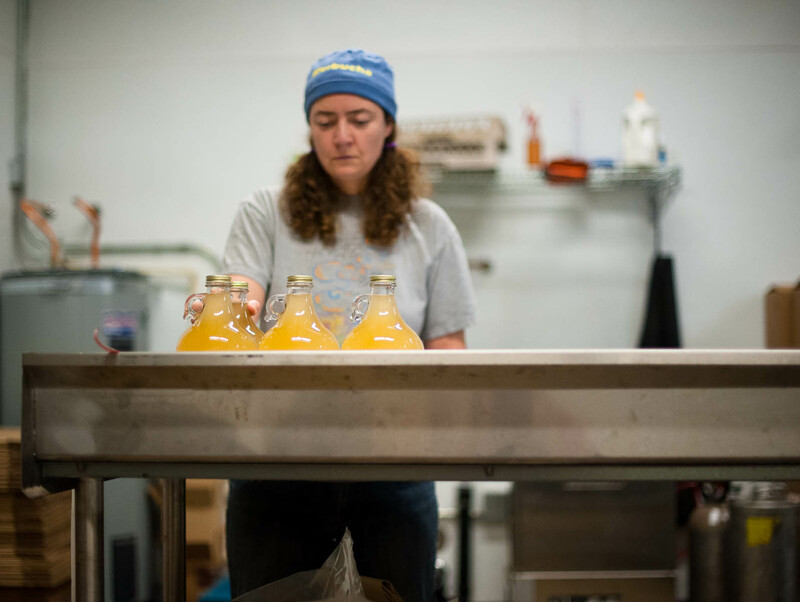 She asked herself: should she continue to make kombucha for herself and friends, or should she follow the advice of friends and embark (bolstered by unemployment checks) into the unknown, creating a business out of her lifelong passion? There’s no cliffhanger here: Eva’s Herbucha is now five and a half years old. 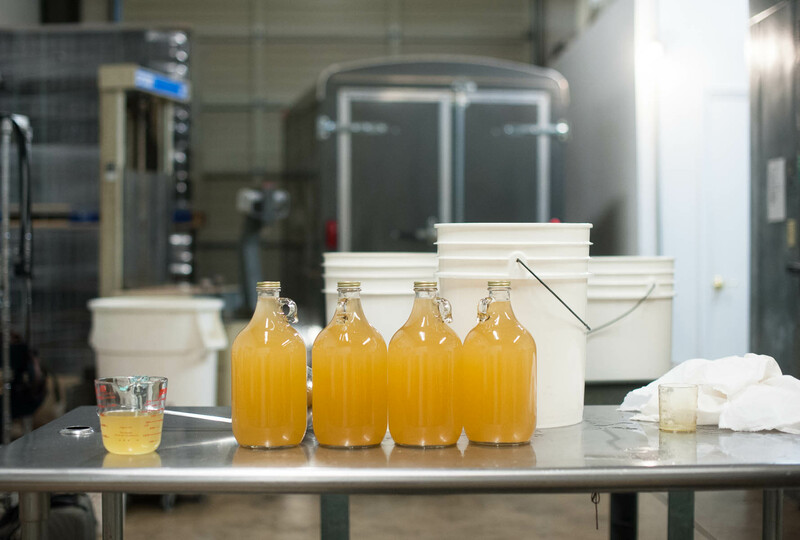 As with all ferments, the process of creating kombucha and its varying flavors involves a medley of simple and complex approaches. The steps seem straightforward when written out – or when Eva explained it to me – but it becomes complicated as soon as you recognize how many ways there are to manipulate flavor: time, temperature (of the brew and ambient), type and/or mix of tea, added flavors, age before bottling. Add to that the not-inconsequential-fact that the fermentation of tea occurs because of an interplay of bacteria and yeasts that we can’t actually see. Kombucha begins its life as brewed tea, cooled to room temperature. Brewers then add a small percentage of mature kombucha (to acidify the tea) and a form of raw sugar. The mature kombucha and the sugar act to stimulate beneficial organisms and give the SCOBY an ideal environment to ferment. With some ferments, the community of bacteria and yeasts that act on the substrate (in this case, tea) to digest sugar and expel carbon dioxide, alcohol, and lactic acid, form a visible cohesive mass. This mass isn’t attractive; it resembles a blobby jellyfish, mostly white and a bit brown, muscular when you touch it. 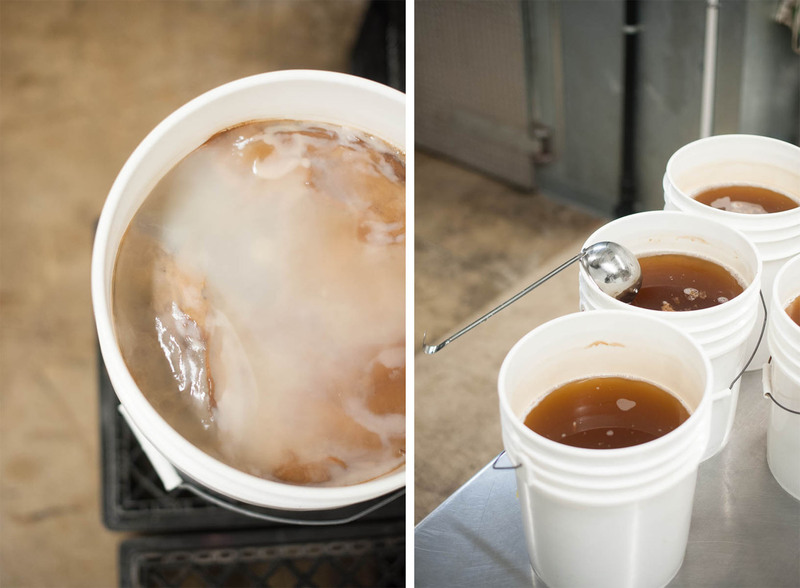 The SCOBY (which stands for a Symbiotic Community of Bacteria and Yeasts) is added to the brewed tea. It floats on top, creating a surface that mimics the size and shape of whatever vessel contains it. As the SCOBY grows and ferments the tea, the yeasts (such as Saccharomyces cerevisiae, Brettanomyces bruxellensis, Candida stellata, Schizosaccharomyces pombe) produce alcohol; the acetobacter present in the SCOBY ferment this alcohol into acetic acid. Because the SCOBY grows and expands during the process, anyone who makes kombucha ends up with more SCOBY than they need. 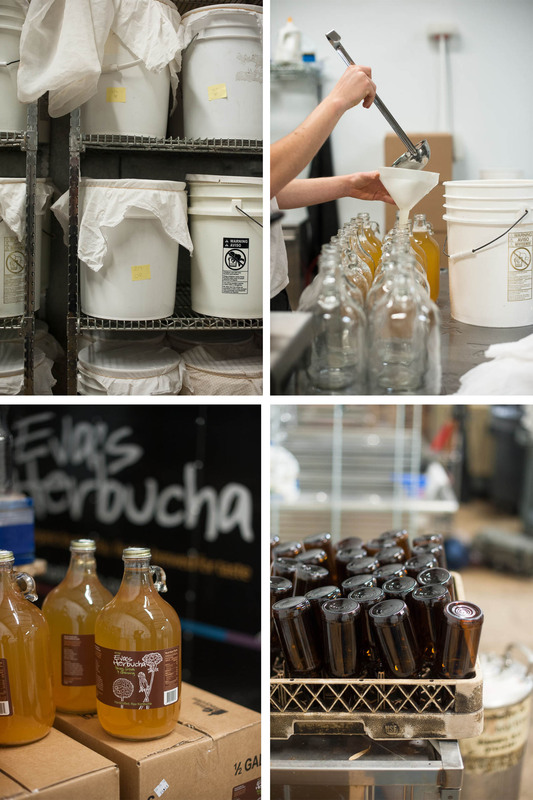 Eva repurposes these SCOBY children into new mothers for future kombucha brews, and she packages the rest of the pieces into starter kits for aspiring home-fermenters to start their first batch. The origins of kombucha are hard to pin down. The fermented tea drink probably dates back to origin of the tea plant in China (though most sources are quick to point out that no written records support any such assumptions). From China, the drink spread to Russia before gaining popularity in Europe. In 2014, kombucha is well into its third wave of popularity in the United States; I can now travel nearly anywhere, from small town Ohio to a random gas station in outer Cape Cod, and find a bottle of kombucha. 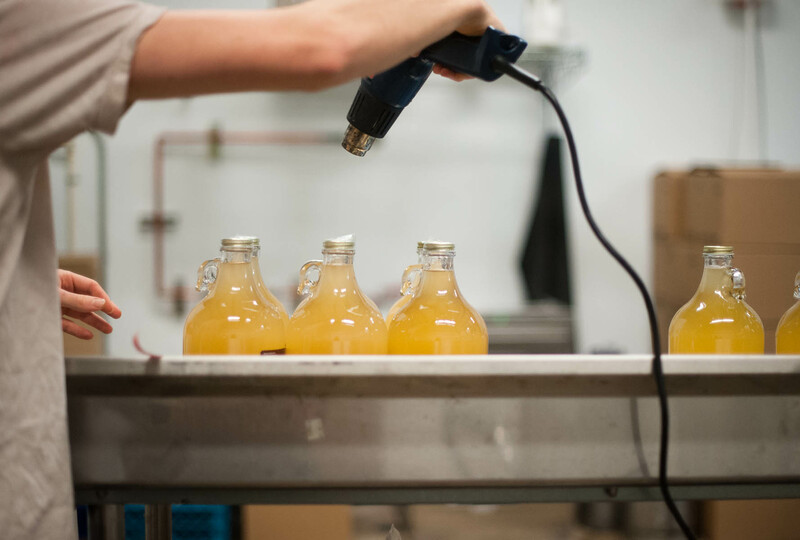 If you’re outside of a major metropolitan area, the most ubiquitous bottle of kombucha is likely brewed and bottled by GT’s Kombucha. As of 2012, Synergy, the owner of GT’s Kombucha, was making 17 different varieties of kombucha, with an estimated annual revenue of more than $150 million. Having kombucha this easily accessible, whether it’s a bottle from massive GT’s Kombucha or local brands like Eva’s, Townshend’s, or LionHeart, is a new phenomenon. In the 1990s, if you drank kombucha, it probably came from your house or your neighbor’s. In The Art of Fermentation, Sandor Katz makes reference to kombucha’s burgeoning popularity in the 1990s among those diagnosed with HIV and AIDS. By 2003, kombucha’s second wave of popularity was propelled forward by the health conscious looking for a drink without the sugar of soda or juice. Because of its eclectic fan-base, once you start drinking kombucha, you can’t help but found yourself surrounded by an interesting subculture. This fact solidified itself for me on a trip last year to Maui, when my husband and I visited Maui Kombucha, a small shop tucked into the back corner of a nondescript strip mall. Feeling like interlopers at a private party to which we hadn’t been invited – people in festive moods spilling out on the sidewalk with glasses of kombucha, reminding me of the open drinking of a more familiar fermented beverage outside pubs in London – we entered the shop with no small amount of trepidation, falsely assuming that we might have stumbled into a locals-only environment. Instead, we were warmly enveloped into what I can only describe as a ‘buch hug, with samples passed to us in tiny cups from the rotating taps while the owners chatted with everyone who came in. These Hawaiian customers were fresh from yoga or surfing, and their collective spirit took my veering-towards-type-A personality aback: Maui Kombucha created a community which allows customers to enjoy another community (of bacteria and yeasts, of course); we ended up visiting three more times. 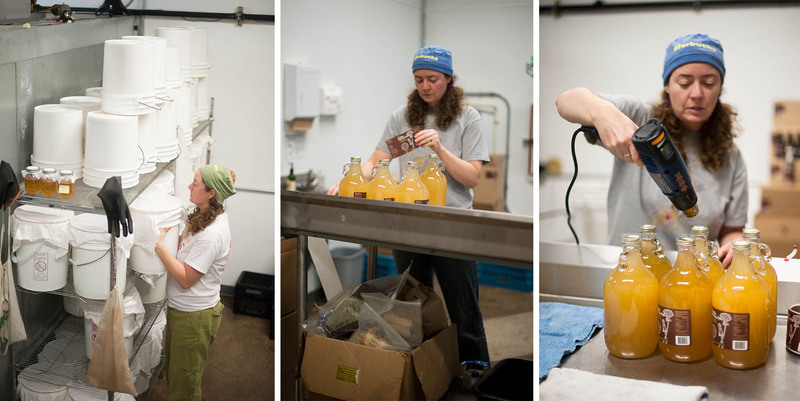 In today’s over-saturated kombucha market, Eva’s Herbucha makes its mark because of Eva’s breadth of knowledge and the herbal elements incorporated into the brews. Eva uses oolong and black tea as the base for two of her flavors (Traditional and Jumpstart), adding small amounts of ginger juice, cayenne pepper, and gingseng to the Jumpstart ‘buch for flavor variation. For her other concoctions – Immune Support, Detox, Uplifting, Goddess Blend, and Rose City Blend – she starts with two parts herbal tea and one part green tea before incorporating specific herbs for specific purposes (for example, Dandelion root for liver and gall bladder detoxification, Astragalus root to lower blood pressure). Eva sells her selection of seven different kombuchas throughout Portland at places ranging from the People’s Food Coop to Safeway. Demonstrating a keen sense of awareness and pragmatism, both in her answers to my questions and in her precise movements and business plan, Eva and her new hire, Jonah, bottle on Mondays and Tuesdays in the windowless warehouse across the street from a Fred Meyer. 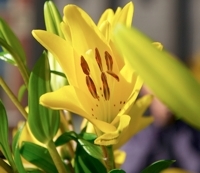 As soon as you open the door, you’re hit by a olfactory wave of sweet acidity mixed with ginger. 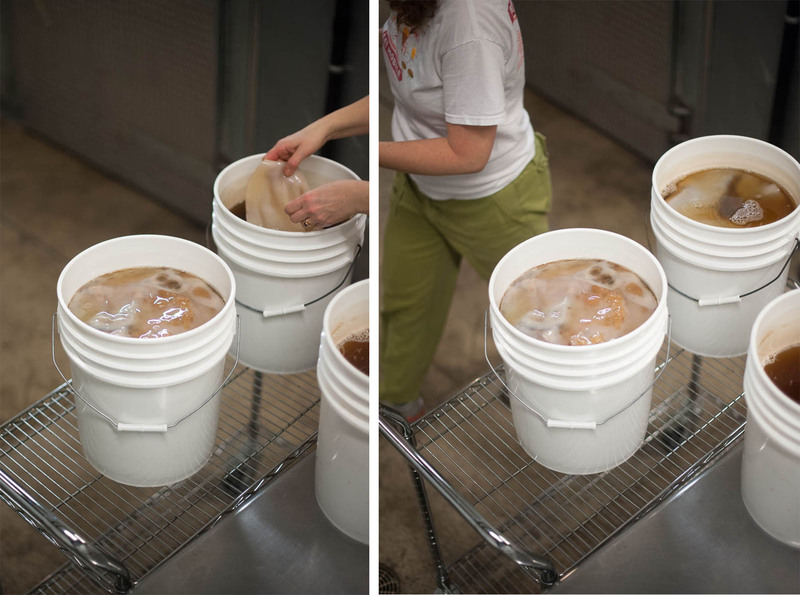 If you compared Eva’s business to an initial starter SCOBY, over the past five years, she’s divided that SCOBY mother multiple times, adding it to more buckets as she’s grown her accounts. As the business has expanded, she’s switched from brewing kombucha in small containers, to industrial ten gallon reclaimed Kikkoman tubs, to now experimenting with giant hundred gallon vats. The warehouse set-up is new too: until June, Eva had brewed and bottled at kitchen space she rented, most recently atPortobello Restaurant (where Eva’s is, naturally, on tap). 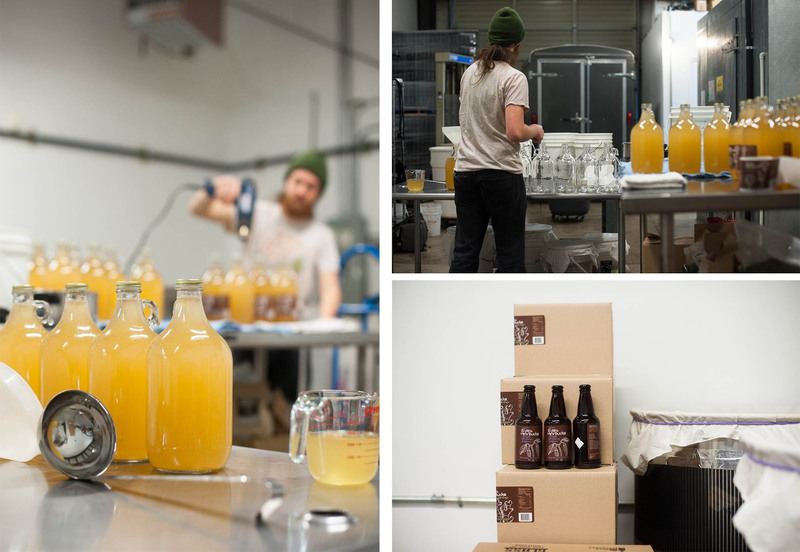 Kombucha isn’t an unassuming drink – its lack of subtly can seem at odds with Eva’s practical, gentle nature. In fact, if Eva were as boisterous or bubbly (or bracing, a word she found amusing when I used it) as her kombucha, the combined package of drink and owner would be overwhelming. Instead, like one of the herbal elements she adds, Eva – owner, salesman, tap puller, marketer, and fermenter – is a level headed and natural accompaniment to her product. She’s less a kombucha peddler than the owner of a business who wisely knows to let the product speak for itself. 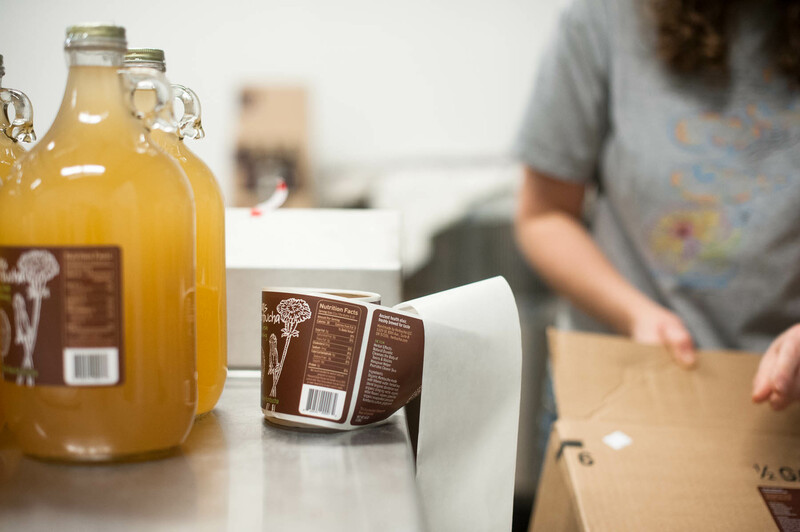 And as our culture continues to seek kombucha in as many outlets as possible, from grocery aisles, to farmers’ markets, to online SCOBY swaps, products like Eva’s show how much possibility there is for variation in fermented tea – not just in the drink, but in the impetus for creating a business around it. When Eva took that leap of faith in 2009, her years of experience and innate understanding of microbial and human communities provided her a safe space to pour herself into the fledgling enterprise. Eva innately recognizes that her Herbucha is much more than a means-to-an-end, but rather, something intimately linked to her person. And her careful nurturing of each fermented batch is apparent in every bubbly sip.